gutsblow: Data Glitch Plugin Released! Data Glitch, a new After Effects plugin to Simulate Realistic Digital Image Glitch is now available for purchase. You can also download the trial version, which renders a watermark. Now, its time to make things go wrong! 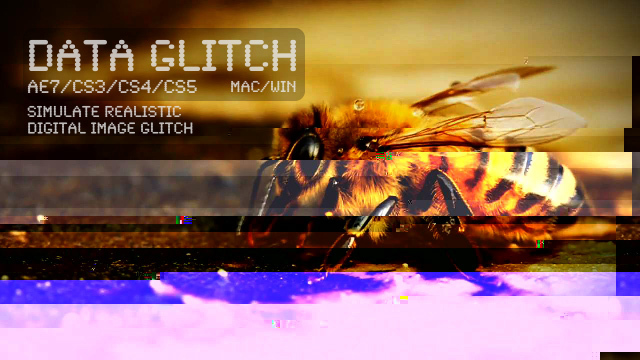 Data Glitch is compatible with AE7 and above, both Win/Mac including a 64 bit CS5 version. Create Awesome Transitions with Ease. Create Audio reactive animations with expressions. Control over the Glitch pattern. Image Type and Strip Type Glitches with quality settings. Here is a demo video created using the Data Glitch plugin. Data Glitch from Satya Meka on Vimeo. Data Glitch is available for a very reasonable price. It costs $49 for a Single User License and $245 for a Site License. Data Glitch is available right now via download and is distributed through Aescripts. If you want to try Data Glitch before you want to buy, you can download the trial version, which is fully functional but renders a watermark. To remove the watermark, you have to purchase the plugin and enter the license. Drop the plugin file (.aex on Win, .plugin on Mac) in the Plug-ins folder of your After Effects. Restart After Effects . Then to apply the Effect, Go to the menu Effects->Rowbyte->DataGlitch.